Black Earth Rising, a British limited series, centers on Kate Ashby, a young genocide survivor who – spoiler alert – realizes in the course of the story that she is, in fact, a survivor of a massacre committed by the Rwandan Patriotic Front (RPF), the very group that ended the genocide. Director and writer, Hugo Blick, invoked his artist’s right to explore stories that “evoke ideas of truth” to shed light on neglected aspects of Rwanda’s recent history, i.e., the fact that the Tutsi-led RPF did some bad things too. However, Black Earth Rising’s main failing is not the topic it “dares” to tackle, but rather its complete lack of contextualization. Blick’s expression of narrative complexity, which is expressed through successive twists leading to the revelation of collective responsibility in the genocide against the Tutsi, crucially eschews depth and analysis. It makes little more than a cursory attempt to explain why the genocide happened, or even why Kate Ashby, its main character, almost died along with her family before being adopted by her British mother. The myopic reality of the series paints all the characters with the same brush, and this may be because it fails to see the background motivations behind their actions and the astonishing complexity of violent conflicts. Black Earth Rising constantly blurs the boundaries between reality and fiction. This version of Rwanda is governed by a leadership straight out of Blick’s imagination, while the chronology is voluntarily left vague. Interviews were given by Hugo Blick also show a tendency to confuse the role and responsibilities of institutions related to its stories, such as the International Criminal Tribunal for Rwanda (ICTR) and the International Criminal Court (ICC). The alleged crimes of the RPF that inspired the story’s biggest twist are not particularly new, contrary to what the show makes it look like. In fact, much of the storyline gives the feeling that Hugo Blick stumbled upon a Wikipedia page about the genocide in Rwanda and, electrified by what he discovered, gave free rein to his imagination. And therein lies the rub: Hugo Blick freed himself from the constraints of reality to enjoy all the liberties fiction can offer, while still presenting its work as a reliable comment on Rwanda’s recent history. But artistic freedom is not an absolute right; viewers, on their part, deserve honesty. If an artist chooses to tell the story of others, a little due diligence should be a minimum requirement. One could argue that giving these overtly fictional characteristics, Black Earth Rising should be taken with a pinch of salt. Yet, that would be overlooking the power of narratives. Once created, narratives spread like wildfire to impact our perception of a topic. This is especially true given that only a handful of narrative films have even touched on the massacre of a million Tutsis and moderate Hutus by a genocidal government and the history of the genocide of the Tutsi is not taught in schools. Black Earth Rising could, therefore, become for many viewers a source of knowledge and imagination about Rwanda. When Hugo Blick limits its depiction of the genocide through short animated clips and lip service (through the words of a character admitting briefly that the genocide was absolute horror), the overwhelming majority of the storyline focuses on abuses by both sides, suggesting at least a moral equivalence. The genocide, the decades of exclusion and brainwashing that preceded it and its meticulous preparation and execution are only a means to get the story started. It also failed to communicate the crude reality of what genocide really is: a policy of deliberate and systematic annihilation of an entire group. 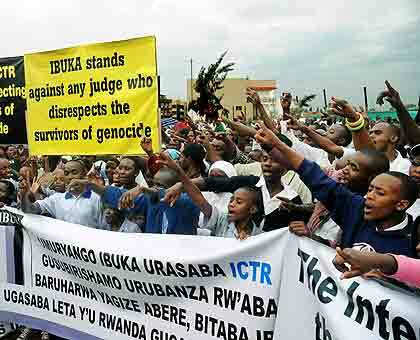 All Tutsis were supposed to die, men, women and children, even babies who had committed the “crime” of being born Tutsi. Can we only imagine the indignation a contemporary series using a similar approach to the Holocaust would have raised? If the BBC had decided to broadcast the story of a woman who, having believed all her life to be a survivor of the Holocaust, discovered that she was, in fact, one of the victims of the attacks by Allied forces that the German people suffered during World War II? It is not the first time tv shows runners find their inspiration in Rwanda’s history to provide a dramatic backdrop for their characters. In 2003, President Bartlet of The West Wing was confronted with genocide in the fictional African country of Equatorial Kundu. More recently, the show Madam Secretary forced its titular character to decide whether to intervene or not in the Republic of West Africa, where a little-known genocide was taking place. But at least, these shows had the decency to locate their storylines in fictional African countries. For genocide survivors, or even viewers appreciating honest storytelling, one can only regret that the creator of Black Earth Rising did not choose to do the same. Ultimately, the limited series is a disappointment whose casual way of addressing a raw and complex history only adds insult to the injuries of millions of Rwandans. Source: By Laetitia Tran Ngoc, First appeared at International Policy Digest yesterday.